Insomniac Games released a new gameplay video for Xbox One exclusive Sunset Overdrive this afternoon. The video has some fun at the expense of fellow open-world game Assassin's Creed Unity. At around the 1:40 mark in the video, Insomniac's Brandon Winfrey answers a reader question: can you play as a female character? "Of course," Winfrey says. "Self-expression is super important to us. You can be female, you can be male, you can be different skin tones. You can be different body types. And all of the clothing is gender neutral." The video then cuts to footage of a female character standing on a rooftop. 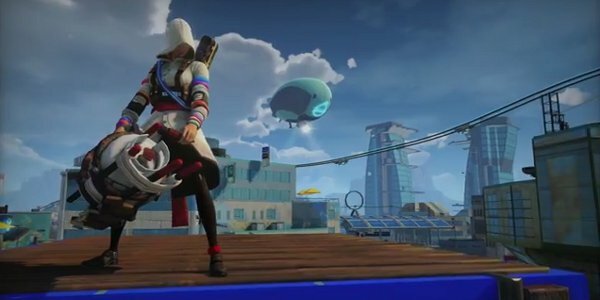 She's wearing a white hood and overcoat - an outfit that clearly resembles Ezio and other Assassin's Creed characters. Adds Winfrey: "So if you want to be a dude in a skirt, you can be a dude in a skirt. Just be who you want to be. Take a stab at it." How is this a dig at Assassin's Creed Unity? Well, during E3, Unity stirred up some controversy because main character Arno and his three co-op companions are all male. Many gamers were disappointed that there were no females in this band of French Assassins. Director Alex Amancio said that including female Assassins were cut because creating avatars of a second gender would take too much time. Amancio later walked back that statement, explaining that Arno is the only playable character, even in co-op. "In Unity you play this character called Arno, and when you're playing co-op you're also playing Arno - everybody is. It's like Aiden Pierce in Watch Dogs." That still doesn't explain why a player couldn't be female to his co-op companions, but whatever. That argument is a whole other article. It was inevitable that some other developer would step in and say, "Ubisoft didn't include female characters but we did. Come play us instead!" Insomniac Games saw the opportunity to put themselves above a rival open-world title and took it. Regardless of whether or not you think Ubisoft should've included female characters in AC Unity, you have to agree that Insomniac made a very media-savvy move here. The video's worth watching even if you don't care about the gender of your character. The first half of the trailer shows how players can use traps to thin the mutant hordes. The traps on display include spinning blades and a trampoline that shoots flames in every direction when jumped on. These gadgets will come in handy during the Night Defense missions we described in our E3 preview. Sunset Overdrive will launch exclusively on the Xbox One on October 28th. Assassin's Creed Unity, as it turns out, launches on the same day.